Click here or on the image left to go to our gas pins page – the broadest offerings in the industry, with superior flow, self cleaning, and replacement injectors. Gas Assist Shut Off Nozzle With Gas Port for affixing gas line, 1-3/4″-8 Male THD Rear End and 7/8″-14 Female Front End for Standard Nozzle Tips, 1/8″-NPT Gas Port. This nozzle is also the standard resin shutoff valve for preventing resin and/or gas from returning to the nozzle barrel for gas assist through in-mold injectors. Adapter – Gas-Assist Shut Off Nozzle With Gas Port, 7/8″-14 Male THD Rear End and 7/8″-14 Female Front Threads, for adapting nozzle tip-end of standard for gas injection and/or resin shutoff function. 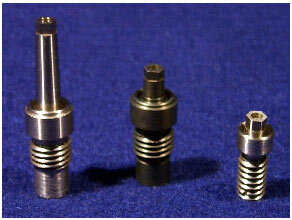 1/8″-NPT Gas Port. Part no. 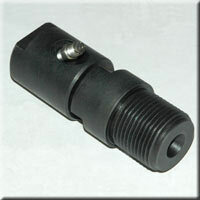 NAS-000 same as above, without provision for use as a gas assist injection nozzle. The ULTIMATE resin shutoff valve for gas assisted and conventional injection molding! The RSOV-III & RSOV-IV, is hydraulically controlled, designed for fast, positive resin shutoff for gas assist and non-gas assist applications. Model IV is specially designed for use with gas assist molding or high pressures encountered during conventional molding. 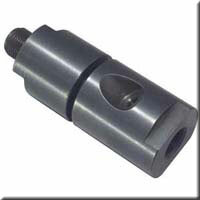 Simple installation between molding machine barrel end cap and resin, or gas/resin injection nozzle. This design is patented due its unique design and operation. Accept no clone substitutes! Gas assist nozzle check valve fits into a gas assist nozzle or any NitroJection gas assist shutoff nozzle, between the gas line and the nozzle or shutoff. Although positive gas pressure downstream from the gas line actuates the check valve, the DET 2-C is spring loaded to assist in the actuation of the internal check valve. The unit prevents resin from returning to the gas line. 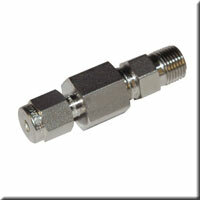 This component is necessary when using the any gas through-the-nozzle application, and should be purchased with CSN-001 or NAS-001.